The couple relocated when Brooke took an intern position at Menlo Park Presbyterian Church, and they discovered that Northern California presented many more opportunities for Nolan’s talent. 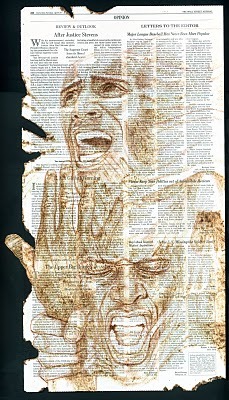 His current work explores the twin themes of justice and redemption. Nolan works in many media, including acrylics, water color and spray paint. His latest works are produced by burning newspaper, a technique he picked up during a family crafts day. “We set the wood burning kit on top of some newspaper,” he says. “I wondered if you could burn the newspaper without going all the way through. Photo of Nolan Lee by Chris Gulker; artist’s work used with permission. Nolan Lee is a blessed and gifted artist and man. He has a sensitive heart that allows him to see beauty through God’s eyes.